How Much People Spend on Food Per Month: How Do You Compare? Most people don’t track how much they spend on food every month — and once they do, they’re appalled to find out how much they actually spend. Most people spend a lot more than they think they do, but it’s impossible to know for sure until you actually track it for a month 15 Cool Tools for Easy Expense Tracking and Budgeting 15 Cool Tools for Easy Expense Tracking and Budgeting Tracking your expenses and budgeting are two crucial parts of being financial healthy. These 15 apps make it easy to do both. Read More . Now let’s say you do know how much you spend. Is it below or above average? Should you cut down because it’s excessive? Or do you have room to spend a bit more on luxury foods? Well, the USDA provides this information free of charge. As of December 2016, the average American family of four spent between $874 and $1,043 per month, the average American male spent about $290 per month, and the average American female spent about $250 per month. The USDA-provided PDFs are a lot more detailed, so you should check them out. What’s nice is that the data is actually divided into five categories: Individual Child, Individual Male, Individual Female, Family of Two, and Family of Four. Within those categories, the data is subdivided even further according to age. Not only that, but the average expenditures themselves are divided into four different plans: Thrifty, Low-Cost, Moderate-Cost, and Liberal. In other words, you can see how much a Thrifty Individual Male spends versus a Liberal Individual Female versus a Moderate-Cost Family of Four. It’s quite eye-opening, especially if you’re seeing this for the first time. 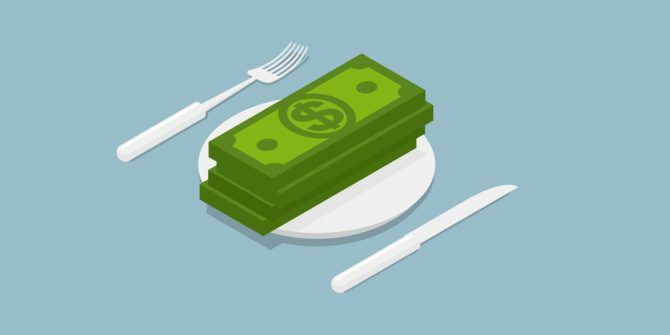 I personally learned that I spend way less on food than even the thrifty folks, possibly because I cook every meal and maintain an under-average caloric intake — so I’ve allowed myself to spend a bit more. A new chart with updated figures is released every month. How do you compare? Was it a surprise or was it close to what you expected? Have you done anything special to cut back on how much you spend? Let us know in the comments!